The Scar-Crow Men, the second of my Elizabethan fantasy novels, is out soon in the US and UK. It’s fantasy noir, renaissance punk, historical fantasy, sword and sorcery, historical urban fantasy or one of half a dozen other labels, depending on who’s speaking. Like some of my other work, the story exists at the point where the fantastic smashes up hard against reality, only in this sequence that reality is in the past, five hundred years gone, among well-documented, pivotal events. Writing historical fantasy – to adopt the broadest label – has its own peculiar demands. We’re talking about an alien world here, with its own customs, clothes, politics, transport, weapons, social classes, art, music and economy and every aspect needs to be fully realized for the reader to settle into it. To say this entails a massive amount of research, doesn’t begin to do the job justice. The writer needs to understand everything, both as its own thing and in context within the time period. This involves more than the invention of a secondary world fantasy, more than looking out of the window or Googling or location research for a contemporary fantasy (both of which I’ve written in the past). Our knowledge of history degrades the further back we go. Characters walk on stage and then disappear. Our understanding of events is based on often-biased accounts. And sometimes there are vast parts of life that are simply missing in contemporary accounts. The Elizabethan Age is reasonably well-documented, particularly with regard to affairs of state. The lives of the common men and women are there too, but the information is scattered widely. While writing this sequence, I sometimes had to embark on three different strands of research for a single sentence. The Scar-Crow Men unfolds in the shadow of the murder of the playwright Christopher Marlowe, a killing that has all the mystery and intrigue of the JFK assassination. 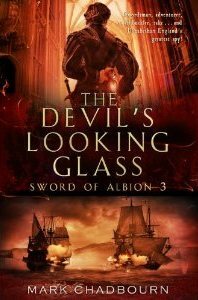 The previous volume, The Sword of Albion (or The Silver Skull in the US), is set at the time of the Armada and the Spanish invasion of England. Over a few posts here I’m going to be writing about what goes into creating these historical fantasies, looking at the places, the people, the milieu, not only setting the context but also underlining the basic premise that the more reality you get, the more effective the fantasy. I look forward to reading the book, Mark – though I might have to hold off for a bit, as I’m currently revising my own manuscript set in the summer of 1593. Having read Charles Nicholl’s “The Reckoning”, I became fascinated with the murder of Marlowe and in particular, the era’s political parallels with modern Britain: religious terrorism, organised xenophobia, rising gun crime and a paranoid surveillance state. Like you I prefer to keep those parallels somewhat in the background, something for readers to notice and think about if they want to, not an axe to grind in their faces. I am awash with Tudor and need more. I shall get yours next Mark. I have the essentials in my head so that I may appreciate all the more your take on things. Looking forward to this series of posts. When reading The Silver Skull, it was quite clear the level of research that went into it. The understanding of how seeing the fantastic things these people see in your story and how it might affect their minds was a dynamic I was not expecting. It’s element often missed in Urban Fantasy…of any time period. There was a ton of those “oh yeah, it probably would’ve been like that” moments. That comes from research. I’m sure were tons of stuff that I didn’t eve notice that just added to atmosphere.